Now, once again I am sharing the steps of making a Bootable USB Flash Drive with Windows XP, by the way I have previously already shared a post titled "Install Windows XP using USB Drive" in which all steps were shown and method defined deeply using Command Prompt but so visitors or viewers still got problem with that even after sharing Video Tutorial on it but anyway it does not matter now because here I'm going to show you the New Method for making Windows XP Bootable USB Flash Drive, I wanna further add here that if someone wants to make Windows 7 Bootable USB then I have already published a post over it with complete methods entitled "Install Windows 7 Using USB Drive", So let's get back to the actual subject. The process or method which I am going to share with you guys here is very simple and easiest method ever compare to previous one, following this method will make least chance for mistakes. 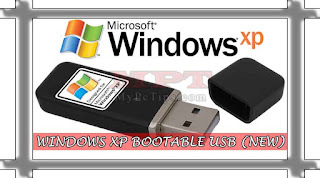 Not only the method, I have also shared a Video over this method and containing proof of successful boot of Windows XP Bootable USB. In this tutorial a small application or you can call a software is required, which is no doubt free and you don't need to worry about it because I am sharing download link of it. So before starting this please backup your USB Data first if any otherwise will be erased permanently, now get ready and follow the below instructions accordingly. Download, Install and Run "WinSetupFromUSB". Now insert "USB Flash Drive" to your PC/Laptop. Hit "Refresh" button to see USB Drive. Check "Auto format it with FBinst" Tool and Choose "NTFS" format. Remain "align" and "copy BPB" checks alive. Insert Windows XP "CD" to PC or mount "Image" file. Now Check "Windows 2000/XP/2003 Setup" and hit small "Browse" button. Locate Windows XP CD Room drive OR Virtual Image Drive then select it. Hit "OK" button if an Information windows appears stating "Use NTFS when possible for maximum speed". If not appear then skip this. Click on "I accept" button of license agreement. Now before starting process, please do "Turn Off" or "Disable" your Anti-Virus Software if using anyone otherwise Skip. Time to Hit "GO" button. Select "Yes" on Warning! window and also "Yes" on Format Warning! Click on "OK" button when Job done and Eject USB Flash Drive as it is ready to use. How to Install Windows with It? Boot System with USB Flash Drive either sequencing USB as first boot or hitting boot menu key. Select "Windows XP/2000/2003 Setup" and "Enter" from booted menu. Now select "First Part of Windows XP" then after reboot continue with "Second Part".